With the end of School coming this month, I wanted to share some great Teacher Thank You gifts from fellow blogging friends. Nothing but Country shared this yummy treat filled Candy Bucket. What better way to say thanks at the end of a long school year than by giving a bucket full of candy? I know I'd feel loved and appreciated! They even share the poem printable so you can make your own Teacher gift. I Saw That... shared some fun Teacher Appreciation ideas. 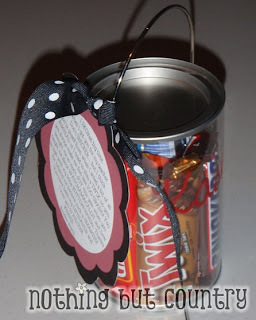 These ideas use everyday items that most teachers either need or want and add some extra cute tags to turn them into a fun gift. Your teacher will definitely love these pens, paperclips or yummy gum as a sweet thank you gift. 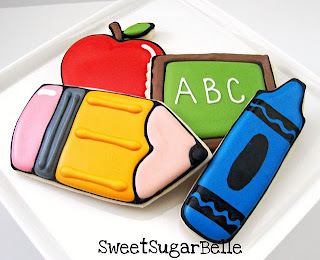 Sweet Sugar Belle shared these fun Teacher Appreciation Cookies. If you've read my blog at all, you know I'm a HUGE fan of Sweet Sugar Belle's beautiful work, and I KNOW your teacher would totally LOVE these cookies. After having tried her frosting technique on my Easter Cookies (with a little impatience), I think these cookies are totally do-able for even the average baker....especially using her detailed steps on how to cut out your cookies into fun school shapes. Chrissy's Crafts shared this yummy Teacher's Appreciation Gift using a toilet roll, cute paper, and some yummy Bliss Candies. You all know how partial I am to chocolate and candy gifts. This is just so cute. I LOVE using a play on words in gifts and this is such a simple and uber cute idea.